This wildly hot, North African chili pepper gets its name from the fact that the plant seeds are dispersed by wild birds that eat its fruits. 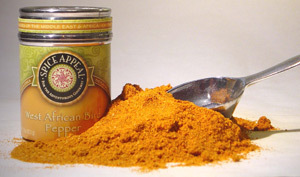 African Bird pepper is the North African equivalent of our cayenne pepper. These fiery devils arrived in Africa around 1500 AD, soon after Christopher Columbus sailed to the New World. Used throughout Africa, in sauces, soups, and stews and as a condiment. Also known in Southern Africa as Peri Peri.